All the people like to take a break from their everyday life to enjoy the nice side of life. 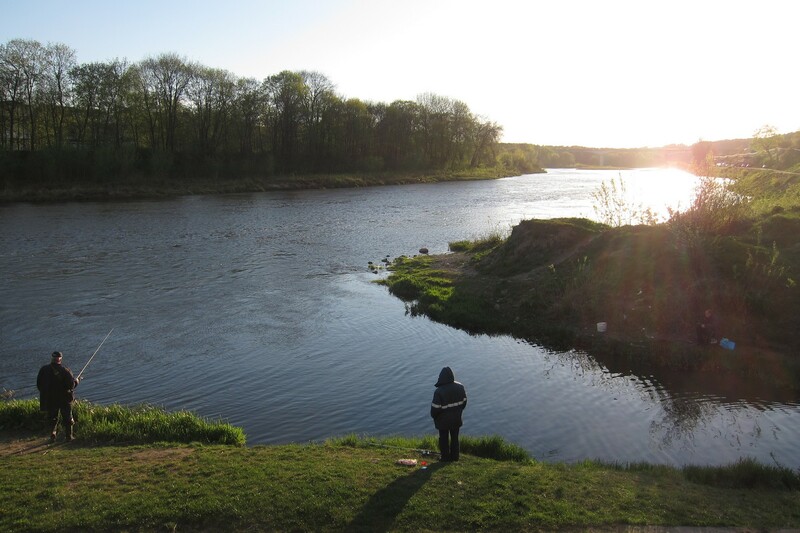 Here in Hrodna they go to the riverside. There young, old, casual and business people relax and enjoy the end of the day. This place defies many “common knowledges”. You don’t have to travel far or live in a different place to enjoy your life. Also the river offers entertainment for many different groups of people. Despite them being very different, they can coexist peacefully in one place. People have multiple reasons to come to the river. 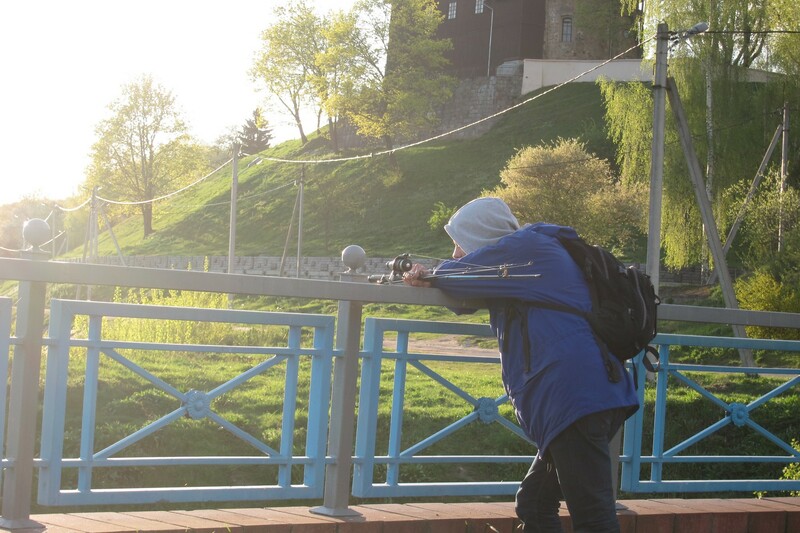 Be it for fishing, to enjoy the view on the city or the nature. All these needs can be fulfilled here. They might want to be alone, meditate for themselves or fish in the quiet company of other fishermen. Watching this kind of people, they were the most quiet people there, focusing on fishing and the occasional conversation or contemplating the sunset and the river. Muffled music coming from the street, diverts the silent onlookers attention. Cars drive by slowly, stopping for at most a few minutes. One can distinguish the kind of people sitting in the car long before seeing them, just by the type of the music they listen to. Young people, businesspeople, workers on their way home. All types of people are driving by, some even twice. Loud music comes from the cars parked near the riverside. Their drivers sit next to the riverside and enjoy themselves chatting, drinking and enjoying the view. Also the occasional couple coming here to enjoy some romantic time should not be forgotten. Some were very active and explored the riverside. They climbed up the hill to the old castle, enjoying everything that is possible to be explored. The most however enjoyed a little walk by the river, not having to do a lot, just enjoying the beautiful view. Also parents didn’t come too short, they made excursions with their children. Some parents combined their walk with taking care of their babies. Also I should not be forgotten, I got myself an interesting story here. One place for many people? All these different people enjoyed spending time in the same place. That is a nice thing and should be encouraged. Instead of these groups always being separated, it might be a good occasion to start a conversation with somebody of the others. Surprisingly noone bothered the others (much). Only those that listened to loud music chased a few people away. Especially when two groups gradually turned the music in their cars louder as to not hear the other ones music, it became unbearable for anyone else to stay there. One should try to respect the needs of the others too, they want to enjoy the same place as well. The same goes for trash, if you enjoy the place, don’t throw your trash on the ground so that the next one can’t enjoy it anymore. Flowers are beautiful, but if you pluck them, nobody else can enjoy them anymore. Previous Previous post: Photostory: Hrodna, the city of Love?